New Titles: Getting acquainted with the Buffett family. In the Spring of 1867, one Sidney Buffett left Long Island, New York, where his family had lived and worked since the 1600s, and took a train West to Omaha. There his maternal grandfather, George Homan, owner of a livery stable and operator of the local stage line, gave him work and introduced him to the local business community. Two years later, in 1869, Sidney Buffett opened a grocery store on south 14th Street in Omaha. The Buffett grocery business would last through three generations and 100 years. It supported and often employed Sidney's progeny, a large, hard working, prosperous, civic-minded, politically involved Omaha family. The Buffetts, always proud of their grocery's pioneer status among Omaha businesses, built their understanding of what mattered in life from their experiences as tradesmen. If family came at the top of that list, success in business was right beside it. In trade, they could not affort to be profligate, or greedy, or to seem so. They were careful with their money. They valued hard work. They were reminded every day of the value of their connections with customers, employees and other businesses. Day by day, in small things as in large ones, they cultivated good relationships with others. They were intensely practical, and when they saw troubles ahead, they saved enough money to sustain their business in hard times. By this means, they grew their business through two terrible depressions, one in the 1890s and another in the 1930s. Buffett's lasted until 1969, and closed then only as regional chains and supplier combinations threatened their profitability. 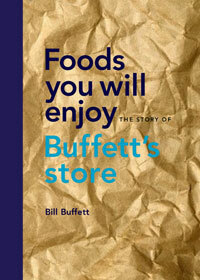 Bill Buffett's book, Foods you will enjoy: The story of Buffett's Store. (Concord: Capital Offset Company, 2008) is the story of the Buffett's Omaha grocery business. The author is Sidney Buffett's great grandson. The book draws on the family's letters and photographs, on local museum collections and old newspapers, on reminiscences by several generations of the Buffetts themselves and by their former employees and customers, and on the author's collection of contemporary advertising materials. All in all, this is very rich source material. For many years, Buffett's store was a community institution in a way that businesses once were but no longer seem to be. The history of the store is told in three dimensions. The first dimension is a narrative, following family memories, letters and local and business history. A second dimension is the inclusion of many telling excerpts of the source material itself, including letters, contemporary newspaper articles, business documents, and letters and later reminiscences by former employees and customers as well as by the Buffetts themselves. 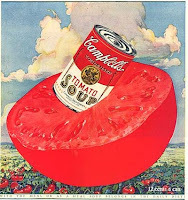 A third dimension is a graphic history, integrating photographs, period media reports, and period advertising materials. Some of the advertising is seen displayed in the store in period photographs, some is now reproduced in color to give the book a real graphic punch. In each of these three dimensions, the book is strikingly well conceived. Each of the three perspectives could almost carry the story by itself. Librarians and scholars are sometimes unjustly skeptical of self-published works. Although this book would be considered self-published, it was professionally designed by Book Designer Rick Rawlins. Not surprisingly, it won an AIGA 2009 "Best of New England" Design award for its designer. Throughout, the book is a reminder that technology now makes it possible to create very high quality books whose expected publication runs are so small that previously, they could never have been published at all. Some of the more memorable things about the book, for this reader, include: The character of Ernest Buffett, as it shines through in the business and family advice he wrote to his sons. The very different way people used to shop, with a clerk gathering individual items from a written list while the customer browsed. Credit too was handled differently. Like one of the Buffetts' customers, in the midst of the Depression of the 1930s, my own grandmother bought the family house outright with cash borrowed at a grocery store, and paid it all back with interest in a year, along with her monthly grocery tab. Not every Buffett went into the grocery trade. One of Sidney's grandsons, Howard Buffett, went off to college wanting to be a journalist. Marriage, and evidently, an effective admonition from his grocer father, led Howard to the more practical, better paying business of selling insurance. In time, Howard moved on to be a stockbroker, then Republican congressman from Omaha. Howard's son, Warren Buffett, the investor, would become the most famous Buffett of all. Warren has said that his start in business came at Buffett's Store. For some months in 1943, Warren Buffett lived with and worked for his grandfather. 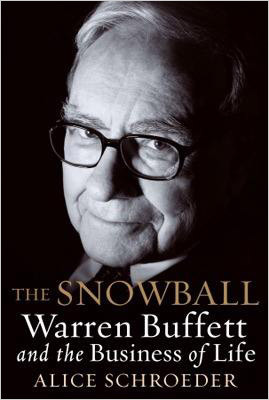 In his own short contribution to this book Warren Buffett recalls that his job at the time was to take dictation from Ernest, who was writing a book whose title was to be "How to Run a Grocery Store and a Few Things I Have Learned About Fishing." Grandpa Buffett, Warren recalls, "considered these to be the only two subjects really worthy of commentary." The author is an insightful historian. He remarks at the beginning of the book that nowdays he buys his toothpaste at a chain store with more than 5,700 outlets in the United States, and he recalls a time when he bought that toothpaste in a local one-of-a-kind drug store. His book seems to remind us of aspects of character and community that we still need, but find hard to sustain as arrangements of work and family life that built them fall by the wayside. This is Bill Buffett's second book. His first, also recently added to our collection, is a memoir of his mother, Katherine Armina Norris Buffett (June 13, 1906-August 17, 2004). Dear Katherine (Self published by Bill Buffett, 2005) is a family scrapbook. It combines Katherine's own memoir about her early life with family photographs, excerpts from letters she wrote and that others wrote to her, some of her recipes, poetry she cut from the newspaper, and so on. Scattered throughout the book are envelopes with onionskin sheets on which are printed the texts of various letters from people recalling Katherine or thanking her for some of the many things she did for others. The book design is interesting. It evokes a family scrapbook with a precious archive of letters pressed between the pages, but the packets of onionskin letters are fragile, and in consequence the book will not stand up to use by many hands. Like the later book, Dear Katherine succeeds in what it sets out to do. Katherine's warmth, generosity and sense of humor shine through. It is also an interesting portrait of a midwestern woman of her generation. Almost all of the materials reflect Katherine's careful cultivation of the informal connections of kinship, friendship and community. These materials testify to the great value her generation placed on such connections, as well as to the way the women of that generation shaped their own lives in a time when the making of a healthy social world was largely women's work. The Foreword reveals the intensity of Katherine's attention to connection. Bill Buffett writes that in the last weeks of her life, when they had spoken openly about her dying, "She looked away, then at me and asked'How will we stay connected.' I assured her we would. This book is part of that effort." These books are quite interesting and are valuable entirely on their own. They have much to tell us about life and business and community over the past century. But it is probably inevitable that some readers will be mostly interested in the Warren Buffett connection. Alice Schroeder's thorough and much admired 2008 biography, The Snowball. Warren Buffett and the Business of Life, covers some of the same territory, and shows that Warren Buffett is a very complex character. Taken together, these books reveal many common threads and shared understandings between Warren and the larger Buffett family. The most striking, for this reader, grows from the family's consciousness of the importance of connection, and their realism, judiciousness and generosity in building networks of business associates and friends. Whatever its other resources, genius needs a firm grip on reality to succeed, and in schooling their generations in the care of connections with their community, the Buffett family created a kind of 'Buffett brand' of realism that appears to survive in Warren Buffett's way of doing business. The Heritage Room welcomes Jeff Barnes as its November Ames Reader. Barnes has recently published his first book, Forts of the Northern Plains. In preparing this guide to the historic military posts of the Plains Indian wars, Barnes traveled some 13,000 miles to visit 51 historic sites making photographs, doing research and interviewing informants about the forts and their history. A freelance writer and fifth-generation Nebraskan Barnes has worked as a newspaper reporter and editor. He is the past chairman of the Nebraska Hall of Fame Commission and former marketing director of the Durham Western Heritage Museum. We look forward to hearing about his adventures. The Reading will take place Sunday, November 15th at 2:00 PM in the Jane Pope Geske Heritage Room of Nebraska Authors on the third floor of Bennett Martin Public Library in downtown Lincoln. Mary Jane Nielsen and Jonathan Roth, Lincoln Looks Back. (Foreword by Gil Savery) Lincoln: JMJ Inspirations, 2009. This is a large format book richly illustrated with black and white photographs from the Edholm & Blomgren Collection and the Nebraska State Historical Society's MacDonald Collection. The book surveys Lincoln, Nebraska's social and commercial landscape, its neighborhoods, schools, businesses, restaurants, drive-ins, and bars from the 1950s to the present. It offers a kind of nostalgic celebration of the kinds of things people remember about a town after the years pass, things like teenage hang-outs, schools, interesting buildings, a big fire, a first visit to Robbers' Cave, meeting a local television personality, or a visit by a national celebrity like Gene Autry or Elvis Presley. The text is a collection of short vignettes and recollections by the authors and the many long-time Lincoln residents they corraled into contributing. The authors have done a wonderful job of bringing the many photographs and individual reminiscences together. They seem to capture the spirit of a certain era very successfully. But their account thins noticeably in the late 1970s. What? No-one wants to look back at the 1980s? Well, anyone who lives in Lincoln now might realize that the book describes Lincoln during an historical era that was ending by the 1980s. In that time, Lincoln's businesses were still mostly locally owned, even along the then nascent "Miracle Mile" North of O Street along 48th Street. In that time, Lincoln still possessed, even on the "Miracle Mile," its most intensely commercial space, a distinctive local landscape, created by local businessmen. In that time, Lincoln still had a commercially viable downtown retail district, attractive to shoppers. If (local) business was better off in those years, community life and family life were also stronger, then, than they would be years later. If we want to ask why the city of those times differs so much from today's Lincoln, we leave Nielsen and Roth's book behind us. But we will return to it. By the late 1970s Lincoln was in trouble, but it was a kind of trouble it would not perceive or begin to pay for until decades later. Developer Joe Hampton was on the city council in the 1970s, and no one in city government was interested in the planning commission's doubts or the pleas of sometime city planner Doug Brogdon to limit suburban development, to keep the downtown area alive. As elsewhere in America, there were huge fortunes to be made in the suburban build-out. With so much money at stake, the build-out could not be slowed or moderated by planners who could see trouble ahead. The present writer recalls a neighbor, one of his mother's friends, crying in her front yard. Had her dog died? No, she was crying over the city. "They're just ruining Lincoln," she told my mother. This lady had attended planning commission meetings for years, but after that evening she stopped. There was no longer any point to that kind of involvement. Like other American cities, Lincoln was transformed by suburban build-out. The downtown area lost most of its larger retail businesses. What remained were much smaller businesses catering to students from the University and downtown office workers, and lots and lots of bars and restaurants. Today Lincoln's commercial landscape is dominated by national chain big box stores and franchise fast-food joints. Money spent in these places leaves town right away. The main shopping areas are now spread out over great distances: North 27th Street, South 27th Street, Cornhusker Highway, Highway 2, various businesses on O Street, both East and West. The sprawl makes Lincoln an ever more inconvenient and unattractive place to shop. Someone willing to drive the distance between these areas might easily remember that a bigger city, Omaha, is only 50 miles away. There, the big box stores are bigger, and there are more of them. Omaha's boxes are even, sometimes, closer together. Someone not willing to drive those distances can now shop online. As a poorly planned conglomeration of developments, built by different developers on different hillsides, with only the weakest of centers, Lincoln can expect its sales tax revenues to continue to fall. America's suburban sprawl been described as plundering the future in order to raise production and consumption in the present. In his 1993 book, The Geography of Nowhere, James Howard Kunstler (not a Nebraska writer) described the way this has corroded our sense of community. "The American highway... is now like television, violent and tawdry. The landscape it runs through is littered with cartoon buildings and commercial messages. We whiz by them at fifty-five miles an hour and forget them, because one convenience store looks like another. They do not celebrate anything beyond their mechanistic ability to sell merchandise. We don't want to remember them. We did not savor the approach and we were not rewarded upon reaching the destination, and it will be the same next time, and every time. There is little sense of having arrived anywhere, because everyplace looks like noplace in particular." This passage of Kunstler's helps me answer the questions I asked when reading Nielsen and Roth's Lincoln Looks Back. No, I don't believe anyone wants to remember the 1980s. In fact I doubt that anyone will bother to write the kind of nostalgic treatment of Lincoln as a community that these authors did for later decades. In the memories of Nielsen and Roth's interlocutors, and especially for those remembering their teenage years, Lincoln's "Miracle Mile," the city's commercial edges and homegrown fast food joints were exciting places. But when the edge metastasized, and became a cancer that ate everything else, it made a wasteland. Nielsen and Roth present us with a group photograph of the businessmen who built the Miracle Mile ("Those Magnificient Men of the Miracle Mile" is its title), just as an earlier generation presented us with "the 'O' Street Gang." Would anyone today bother to take a group picture of the managers of Lincoln's big box retail stores? And if they did, would anyone care to publish such a picture? Kunstler is right, we don't want to remember these places. Lincoln made sense as a more compact city. If it had retained some of that compactness, it would been distinctive in comparison with Omaha. It might have been a more attractive place to live, shop, and to do business. Without that distinctiveness, Lincoln's future looks bleak, since Omaha, only a little ways down the road, has a bigger population and with that, more resources, including more interesting retailers. It still seems surprising that Lincoln did not do better over the years, given the twin advantages of the presence of State Government, and the University. Government workers and University students are an economic resource, and no doubt they have saved the downtown, which is only moribund, from becoming a deserted urban combat zone, as it might have become, in their absence. In other times, the presence of state government and the University might have reminded us of the importance of public concerns. Adequate repect for public purposes is the essence of good urban planning. In his book, Kunstler observes that the "joyless junk habitat" that we see along our commercial highways and arterials is a product of our having discarded public concerns to pursue "a fetish of commercialized individualism." Unable to give anything but lip service to public needs, we had "nothing left but private life in our private homes and private cars." So "we wonder what happened to the spirit of community." We discover that we "created a landscape of scary places and became a nation of scary people." Our ugly, anonymous places empower those who lie, cheat and steal. Kunstler laments suburban sprawl as a cultural and environmental catastrophe. He shows us that sprawl is now a physical embodiment, a map, of our character and of the poverty we will face in the 21st century. Sprawl embodies our lack of connection, it maps our lack of respect for public goods, it maps our hatred of nature, it maps our greed, it maps our lack of respect for each other (consider the way people drive on expressways like Lincoln's North 27th Street). Low density sprawl, with its monotony of housing types and strip malls, is utterly dependent on cheap energy, and "virtually impossible to retrofit with decent public transportation." Distant from productive economic actitity, these are future slums. Not every McMansion can have a second life as a money-making group home. The sprawling mess of suburbia will be a monument to an America that imports almost everything and that has exported its skilled and industrial jobs of all kinds to other nations. Building the suburban wasteland has been a way to shore up employment, to store workers, and keep the country's economic decline from becoming too soon visible. Yet the historical period defined by low gasoline prices, and by complacency about trade policies and technology and the outsourcing of American jobs seems about to end. As the wreckage of suburban sprawl becomes increasingly costly to live with and remedy, we will remember this era with anything but nostalgia. Lincoln already struggles to escape the problems brought on by this kind of development. Teenagers form their social networks not at the Drive-in, or any of the other places Nielsen and Roth describe, but on-line. Local business leaders and politicians are trying to remedy the sickening of the center with new development, a new downtown arena, the Antelope Valley Project, and retail recruitment. But many of these efforts seem to share the assumptions of the passing age of “happy motoring.” (Kunstler's term) Some, though, as in the Haymarket, try to build on the remains of an earlier and more attractive urban environment. The local trails network tries to make the place more livable, and sometimes succeeds. For this reader Lincoln Looks Back served as a reminder of an entirely lost world, separated from us by a disaster--one we barely understood as it engulfed us. The contrasts between that world and today's are striking. It is scary to step back from the Lincoln we think we know, and realize that physically, it so largely resembles the landscape of "the futureless economy" that writers like Jane Jacobs and James Howard Kunstler described long before the recent mortgage crisis began. As we discovered when when we put together our online exhibit on Nebraska writers of the 1930s, the hardships of the time caused deep reflection about American history, community and shared purposes. American intellectuals and the New Deal programs they helped create seemed uncomfortably radical to some at the time, but at heart, they opposed the despair and empty radicalism that triumphed abroad in same decade. When the Nebraska History Museum opens its new exhibit "Out of the Despair of the Spirit: Nebraska's New Deal Art" on October 3, (See the Museum Events Calendar there will be three concurrent exhibitions of 1930s era artwork running in museums around Lincoln. This ongoing exhibit at the Lux Center presents portraits of America in the 1930s by artists Harry Sternberg, Lily Harmon, Marion Greenwood, Guy Pene DuBois and others who worked for the New Deal's WPA (Works Progress Administration) division known as the Public Works Art Project. Opening September 29, 2009 this Sheldon Museum of Art exhibit presents works done in the 1920's and 1930's by Mexican Muralists and artists in the United States' Works Progress Administration (WPA), all from the Museum's permanent collection. Included are works by well known artists Diego Rivera, Jose Orozco and David Siquieros, as well as work by other Mexican Muralists whose names are less recognized. A description is here. In addition, on the national level, the Smithsonian Institution Exhibit "1934: A New Deal For Artists" is ongoing through January 3, 2010. Nebraska writers’ encounters with Hollywood and film-making have been as diverse as writers are individual. Some writers sought attention from film-makers, others shunned it. Some Nebraska writers have been pleased by what film makers did with their work, others were horrified and hated it. Some writers came to write novels after careers as playwrights and screen writers, others specialize in screen writing, or have turned to it as a profitable sideline. The display itself is mostly devoted to the books and writers themselves, but in preparing it, we also looked at the history of film-making in Nebraska, and careers of actors and directors from Nebraska. Usually we hide that sort of background preparation. This time we decided to summarize our notes on the history of film-making in Nebraska here. That history seems to encourage us to ask these questions: Does Nebraska make it onto the silver screen as a real place, or is it more often assimilated to Hollywood clichés about middle America and “fly-over country”? What role has film experience played in the careers of Nebraska writers? Has the work of Nebraska writers been well represented on film? What will Nebraska look like in the films of the future? The first feature film actually made in Nebraska was made by Nebraskans in 1915. Chadron residents organized the Black Hills Film Company of Chadron, Nebraska to make “In the Days of ’75 and ‘76” or (in a different advertisement) “The Thrilling Lives of Wild Bill and Calamity Jane” entirely with local talent. The Twelfth Cavalry out of Fort Robinson appeared again, portraying troops of the earlier era. The film survives and the community effort recalls an enthusiastically presented high school play that is as much a local festival as an attempt to dramatize a story. Early in the Hollywood era, most filming was done entirely in Hollywood, but beginning in the late 1930s scenes for some films were shot in Nebraska. The first such film was Boys Town (MGM, 1938) with Spencer Tracy and Mickey Rooney. Tracy won an Oscar for his portrayal of Father Flanagan, and the sequel, Men of Boys Town (1941) also filmed scenes in Nebraska. In 1940, background scenes for Cheers for Miss Bishop, the film adaptation of Nebraska writer Bess Streeter Aldrich’s novel Miss Bishop, were filmed on the University of Nebraska campus, and several hundred students served as extras. In the summer of 1945 MGM filmed background scenes for The Sea of Grass (1947) on former Nebraska governor Sam McKelvie’s By the Way ranch in the Nebraska Sandhills. Martha McKelvie wrote about work of filming and the Sandhills people involved in the By the Way newsletter for Christmas, 1945. The action in the story, based on Conrad Richter’s novel, takes place in Arizona and New Mexico, so the Sandhills just served as generic “ranching country” landscape for the film-makers. A fairly comprehensive list (http://www.neded.org/content/view/516/1256/)of films made (at least in part) in Nebraska is available on-line from the Nebraska Film Office, a department of the Nebraska Department of Economic Development. The Film Office’s interest is in how much money film-makers might spend in the State, and the economic boost such spending can give to local communities. Looking at the Film Office’s list, we see some patterns emerge in films made in Nebraska. First, it looks like the relatively few big-studio films made here could have chosen any state or town in the Midwest as a setting. We remember Terms of Endearment (Paramount, 1983) now mostly because of then Governor Bob Kerry’s romance with Debra Winger. It’s fun to see bits of Lincoln on film, but similar scenes could have been shot in Des Moines, Kansas City, or Minneapolis. Second, we encounter stories that reflect on real life or that have actual Nebraska roots mostly in smaller scale documentaries or television productions of work by Nebraska writers. Notable, among these, are the NETV-PBS 1987 documentary The Trial of Standing Bear, the 1992 Hallmark Hall of Fame O Pioneers!, and the 1994 filming of My Ántonia all for television. Sean Penn’s Indian Runner, 1991, and Omaha-The Movie (1993) also have Nebraska moments (well, for the latter, a visit to Carhenge, anyway!). Finally, the list reminds us that screenwriter-director Alexander Payne has made more movies here than anyone else. Payne grew up in Omaha, went to High School at Creighton Prep. He writes his own movie scripts, usually in partnership with writer Jim Taylor. Payne is not trying to tell Nebraska stories at all. Yet he is interested in a reality that big-studio, big budget films tend to miss. “I want my protagonists to be more like real people than like typical movie characters,” he told an interviewer, “I’m interested in capturing life…. I don’t do special effects.” Payne returned to Omaha to make his first film, Citizen Ruth, in 1996. His commercial breakthrough film, “Election,” a dark high school comedy with Reese Witherspoon and Mathew Broderick, filmed at Papillion-La Vista High School in Omaha. And most recently, his “About Schmidt, 2001, filmed in Omaha, Nebraska City, and Lincoln, and starring Jack Nicholson. Payne has won critical acclaim and many awards, including two Golden Globe awards and an Academy Award for his scripts. What is more, all his films have been commercially successful. Payne, reviewers have pointed out, has something of a formula: His small film, low budget strategy allows him to retain editorial control of the film. If he spent more, studios would want more influence. With his strategy he has been able to make profits from his films without being compelled to seek a mass audience. He seems to favor character studies that present something of the tragedy of the human condition with a biting sense of humor. Might Payne’s example give us a look at the future of film in Nebraska? The concern of the Nebraska Film Office, whose list of films we have been considering, is to explore motives that bring film-makers to the state and promote the state to film-makers for the sake of economic growth. To this end, the office commissioned the 2002 Nebraska Film Industry Development Study (available at the link as a pdf file). The document is a little dull—writers in this genre are obliged to collect facts, avoid thinking, and repeat whatever economic clichés are widely acceptable at the moment. But despite itself, the Study offers amusing observations. As in: “Wow, those folks really dropped a lot of money in Loma!” (No, no. Not an actual quote!) The 1994 filming of To Wong Foo, Thanks for Everything, Julie Newmar spent some 8 million dollars in the state. The film, with opening scenes in New York, New York and a San Francisco denouement, offered up the story of three bicoastal transvestites stranded in small town Nebraska. It wasn’t really a home grown story. But it did show that a big studio, this being a Universal/Amblin Entertainment production, can drop an astonishing amount of money to purchase pretty simple requirements. The most interesting aspect of the Study, is that, though confined to the decade from 1991-2001, it tells us still more about Alexander Payne. Omaha—The Movie (Payne was executive producer) dropped $50,000 here, Payne’s first film, Citizen Ruth, spent $1,500,000 in Nebraska, Election, $1,252,840, and About Schmidt, some $8,000,000. The choice of Nebraska for To Wong Foo, Thanks… can be seen as a rare, chance event, unlikely to recur with any frequency. This view is reinforced by the Study’s observation that, from now on movies that require a generic “Great Plains” landscape will be filmed on the Canadian prairies, because the cost there is so much less. Payne, by contrast, chose to make some of his films here from real local knowledge and connection to Omaha. If we see much of Nebraska on film in the future, it’s most likely to be in films that have that kind of real local connection. We might expect such films to follow some of the patterns seen in Payne’s films. They would likely have smaller budgets, with more artistic control by directors who choose to film here. They would probably not seek to draw mass commercial audiences. They would be less driven by fantasy and sensationalism and more by diverse engagements with the fabric of real life. Such films will be made, if they are made at all, by people with direct connections to the actual local culture and the film culture of the state. This would seem to be treacherous ground for the economic development frame of mind to tread. Nobody can simply promote a working culture into existence. The personal connections, institutions and funds that support local culture are either built and sustained over time by genuine community effort, or they will fall away and we will be lost in the “geography of nowhere,” where every street, every mall, every subdivision looks alike, and culture is reduced to a daily dose of frivolous spectacle whose only theme is distraction. But Nebraska’s film community now seems lively, though small. Alexander Payne continues to contribute, returning for special events and serving on the board of Omaha’s Film Streams theater. Andrea I. Paul, “Buffalo Bill and Wounded Knee: The Movie,” Nebraska History, Winter, 1990, Vol. 71 No. 4, pp 183-190, describes Cody’s movie and contemporary critical responses. Thomas R. Buecker, Fort Robinson and the American Century, 1900-1948 (Nebraska State Historical Society, 2002) also describes the involvement of the Twelfth Cavalry from Fort Robinson in this film and in the Chadron film. On the Black Hills Feature Film Company of Chadron, Nebraska and its seven reel epic, see Paul Eisloeffel “Preserving Nebraska’s Film Heritage” Nebraska History, Spring 1995, Vol. 76, No. 1, pp. 28-9. Alexander Payne, quoted in Bob Fischbach, “Pure Payne” in the Omaha World Herald, Arts and Travel section, October 24, 2004. On Payne filming in Nebraska, L. Kent Wolgamott in the Lincoln Journal-Star, December 30, 2005. All the amounts given here are listed in the Nebraska Film Industry Development Study in a table titled “Direct Expenditures” under the column label “Revenue Generated.” The labeling is ambiguous because these kinds of studies sometimes fudge things by considering “revenue generated” to include the total economic activity. That would considerably magnify the amount actually expended by including the estimated circulation within the community of the original amount spent. This measure of “revenue generated” is also a legitimate measure of economic activity, but should not be confused with “direct expenditures.” That does not appear to be the case here, however, as far as I can tell. The Heritage Room welcomes Amelia Montes to begin our 25th year of Ames Readings. Born and raised in Los Angeles, Montes has been a professor at the University of Nebraska-Lincoln for a decade. She writes fiction, critical literary theory, non-fiction and criticism. Most recently, she introduced and edited a critical edition of Maria Amparo Ruiz de Burton's 1872 novel, Who Would Have Thought It? Burton was the first Mexican-American woman to write novels in English. The program will begin at 2:00 P.M., Sunday, September 20th. Harry Duncan, (translator) I come to that point on the wheel: Dante Alighieri, Io son venuto al punto de la rota. Bradypress, 1994. This chapbook was printed to present to Harry Duncan to celebrate his receiving the Jane Geske Award from The Nebraska Center for the Book in 1994. Duncan, (1917-1997) was one of the leading figures in the revival of printing by hand. In 1982 Newsweek Magazine called him "the father of the post-World War II private-press movement." He began printing by hand in 1939, and over the years he would print Robert Lowell's first volume of poetry and many other works of contemporary literature. Duncan came to Nebraska in 1972 to operate a press at the University of Omaha, for which he created the Abbatoir Editions imprint. Our collection also includes his Doors of Perception: Essays in Book Typography, W. Thomas Taylor, 1987, a meditation on Duncan's years of experience in book design, as well as a number of Abbatoir Editions of works by Nebraska authors. Loren Ghiglione, CBS's Don Hollenbeck: An Honest Reporter in the Age of McCarthyism. Columbia University Press, 2008. Lincoln native Don Hollenbeck, a journalist who got his start writing for the Lincoln Journal and later, Hearst's Omaha Bee-News, is an important, and tragic, figure in the history of American journalism. This first in-depth biography of Hollenbeck has garnered praise from critics and from many now well-known journalists who knew Hollenbeck personally. William Kloefkorn, Breathing in the Fullness of Time, University of Nebraska Press, 2009. Nebraska's State Poet has been giving us a multivolume memoir of which this is the fourth installment. Reviewers have noted that the poet's powers of observation and command of language make this a uniquely interesting account of life on the edge of the Great Plains from the 1930s to the present. How did Nebraska's official State Poet also become the Nebraskaland Hog Calling Champion? Read this volume and find out. Ladette Randolph, A Sandhills Ballad, University of New Mexico Press, 2009. Nebraska author Randolph, who has received the Pushcart Prize, three Nebraska Book Awards, and many other accolades, has published many short stories and essays. She is now director of Ploughshares and Distinguished-Publisher-in-Residence at Emerson College in Boston. This is her first novel. A new display in the small case in the front of the Heritage Room looks at a selection of writers’ artwork, with the idea that such efforts are an interesting, but often overlooked aspect of their creative lives. Included are illustrations by Ted Kooser, Paul Johnsgard, Mari Sandoz, Rudolph Umland, Dorothy Thomas, Timothy Schaffert, and James Solheim. Mari Sandoz (1896-1966), among the most celebrated of Nebraska authors, wrote about the character of the people of the Great Plains, the conflicts between ranchers and farmers, white men and Indians, all shaped, in turn, by the harshness and beauty of the Plains environment. She was before her time in understanding how global financial interests drove the exploitation of the American frontier, and in her appreciation for the resulting destruction of the ecology of the Plains, and of the lives of her protagonists. In the idiom of her own time, Sandoz was a “regionalist” writer, if we understand by regionalism, not localism or local color, but a disciplined cosmopolitanism attentive to the specifics of the history, language, and environment of a particular region.When Sandoz signed a book, she often made tiny sketch, you could almost just call it a doodle, next to her signature. Perhaps it is a spot along the Niobrara near the Sandoz homestead, but this is speculation. That sketch seems more “complete” in some cases than in others, but when all the elements are present, they are always about the same. On display: Mari Sandoz, The Beaver Men: Spearheads of Empire, 1964. Signature and dedication on the Half-Title page. Ask to see:Other signed copies, Sandoz page proofs. Paul Johnsgard: Paul Johnsgard is, at one and the same time, a world renowned scholar of waterfowl behavior and the world’s most published ornithologist (ever!). His monographs and reference works on North American birds and bird groups, and on birds around the world provide the most comprehensive and accurate view of bird life, behavior and ecology available to us. Over 250,000 copies of his works on birds are scattered around the world, in four languages. He is a powerful advocate for regional and world wide bird and habitat conservation. Johnsgard has also written several classic works of regional natural history, all devoted to Nebraska—on the ecology and natural history of the Platte river, on the Sandhills, on the Niobrara river, on Nebraska as a whole, and on the world of the Prairie Dog. Altogether, Johnsgard has written over 50 books, and many of them, especially those on bird behavior and on natural history, are illustrated with his wonderful black and white pen and ink drawings. He prefers to do his own drawings, noting that it has been easier to publish because he does not have to hire an artist. Besides, artists may be prone to mistakes. “I can actually look at forms of bird and see flaws,” he told a 1989 interviewer. Johnsgard prefers, for the most part, to draft full, life-size illustrations. The artwork you see reproduced in his books is then shrunk to fit the page. On display: Paul Johnsgard, This Fragile Land: A Natural History of the Nebraska Sandhills, 1995. Signed copy with dedication to Norm and Jane Geske, with an additional drawing across from the title page. Around the room: Drawings and two bird carvings by Paul Johnsgard. Ask to see: Johnsgard manuscript collection, drawings for Dragons and Unicorns: A Natural History, 1982 (with Karin Johnsgard). Johnsgard talks about his writing and his artwork in three installments of our Ames Reading Series (including a collaborative reading with poet Twyla Hansen). Lisa Knopp, Interior Places. (2008), a collection of personal essays about nature and place. Knopp's earlier books include her critically acclaimed The Nature of Home: A Lexicon and Essays (2002). The Nebraska-Kansas Act of 1854. (Lincoln and London, 2008) a collection of essays edited by John R. Wunder and JoAnne M. Ross. Contributors include Wunder, Ross, James A. Rawley, and some others with connections to the University of Nebraska. Rick Cypert, The Virtue of Suspense: The Life and Works of Charlotte Armstrong (2008). Cypert is Professor of English at Nebraska Wesleyan University. Cypert has also published a biography of Nebraska Writer Mignon Eberhart, America's Agatha Christie: Mignon Good Eberhart, Her Life and Works (2005). David A. Taylor, Soul of a People: The WPA Writers' Project Uncovers Depression America. (Foreword by Douglas Brinkley), 2009. This book accompanies the Smithsonian Channel documentary of the same title. It has a chapter on Nebraska writer Rudolph Umland, uses some photographs from Heritage Room collections, and references our web exhibit on the Nebraska Federal Writers' Project. Stephanie Grace Whitson, Secrets on the Wind (2009), collects three earlier Whitson novels, Secrets on the Wind, Watchers on the Hill, and Footprints on the Horizon into one volume. Peter Crowther, ed. We Think, Therefore We Are: 15 original tales about the nature of artificial intelligence (2009) includes the story "Three Princesses" by Nebraska writer Robert Reed. Stephen R. Lawhead, Tuck (2009). This completes Lawhead's King Raven trilogy. Victoria Alexander, The Virgin's Secret (2009). Another romance from best-selling author Alexander. One of these days the Heritage Room should do a display on bodice-ripping covers. Former Lincoln resident Harley Jane Kozak is an actress whose film credits include Parenthood, The Favor, and Arachnophobia. She is also the author of a popular comic/mystery series featuring greeting card artist and amateur detective Wollie Shelley. Kozak's book titles include Dating Dead Men, Dating is Murder, Dead Ex, and most recently, A Date You Can't Refuse (2009). She will present the Ames Reading at 2:00 PM on Sunday, May 17th. James R. Griess was born on a farm in York County, Nebraska. All four sets of his grandparents were German Russians who came to the Sutton, Nebraska area in the last quarter of the nineteenth century from the Volga and Black Sea regions of Russia. He has a strong interest in history and genealogy and has recently published a book length study: The German Russians: Those who came to Sutton (Henderson: Service Press, 2008) The book offers a broad picture of German Russian history and culture and of the causes and history of this group's immigration to America, before focusing in on the German Russians in Sutton Nebraska. Mr. Griess will present our Lunch at the Library talk on Wednesday April 1 at 12:10 pm on the fourth floor of Bennett Martin Public Library. Bring your lunch and enjoy coffee provided by The Mill! Postscript:(April 1, 2009): So many people came today and everyone enjoyed Jim's talk so much that we have already arranged for him to return in the fall to continue the story at another Lunch at the Library, at a date to be announced. Thanks for coming! The 28th Annual Neihardt Spring Conference, Saturday April 25th, 2009, will focus on "Neihardt and 21st Century Native Realities." For more information, check the Neihardt Center Events web page. Presenters will include Delphine Redshirt, John Day, Judi Morgan-Gaiashkibos, and Walter R. Echo-Hawk, jr. In Nebraska, the historical giants of crime fiction are Mignon Good Eberhart (1899-1996) and Jim Thompson (1906-1977). Eberhart was a classic creator of fictional detectives who combined her mysteries with elements of the romance novel. With some 59 novels to her credit, she is the most prolific Nebraska novelist ever. In her day, which stretched from the 1920s to the 1960s, she was very popular. By the late 1940s she was the third highest earning woman mystery writer in the world, right after Agatha Christie and Mary Roberts Rinehart. Jim Thompson’s writing contrasted starkly with Eberhart’s. Growing up in Oklahoma and in the Sandhills around Burwell, Nebraska, Thompson had an intimate understanding of harsh realities of poverty and drink that could engulf the wished for gentility of middle class life. Thompson came to himself as a writer in Lincoln in the 1930s, under the tutelage of Lowry Wimberly. Thompson’s writing explored the dark side of the American experience, the inner world of the criminally insane, or the sudden fatal inspirations of a half-formed, trapped, and uncomforted American everyman. Thompson’s writing has a sharp bite. Readers and critics now have a greater appreciation for his work than they did during his lifetime. If Mignon Eberhart’s heroines all find their way, from some exotic setting, to middle class dreams and ideals, Jim Thompson’s stories corrode middle class dreams and distort them into nightmares. Omaha native and resident Richard Dooling is a lawyer who has written collaboratively with Stephen King. His scripts and novels are making their way into television and the movies. Dooling writes mysteries that offer a darkly comic views of contemporary cultural decay and technology, topics he also addresses in critically acclaimed non-fiction. His first novel, White Man’s Grave was a National Book Award finalist. His more recent Bet your Life is about investment, insurance fraud, and the corruption of cube life in an Omaha insurance company. Sean Doolittle, from Hickman, is a master of the detective mystery whose books have won a number of awards, including an Amazon.com “best 100 books” award in 2001, “book of the year” awards from Forewords Magazine (2003), and Crimespree Magazine (2006), among others. Doolittle lived and worked in Los Angeles before moving, a few years back, to Omaha. His most recent books have Nebraska settings. Raindogs is set in the Nebraska Sandhills, and The Cleanup in Omaha. Both books have gotten rave reviews in the national press. Alex Kava is an internationally best-selling mystery-thriller writer whose books have appeared on the New York Times best seller list, and on similar lists in Britain, Germany, Italy, and Australia. She has said that “I love using Nebraska as a setting because so many people have such a misconception of the state and it gives me an opportunity to share what it's really like.” Her gritty, carefully researched fiction is sometimes based on real events. Omaha native and Omaha Westside graduate Julie Kaewert began to write mysteries after working for a London publisher. Her detective series carefully explores the intricacies of publishing and the rare book and manuscript trade. Famed London rare book dealer Ed Maggs, current proprietor of the famous Maggs Brothers Books, founded in Charles Dicken’s day by Uriah Maggs, has allowed Kaewert to include him as a character in her fiction under his own name. Kaewert’s books appeal to those who especially love literature and the book trade. Kaewert also co-wrote the novel that accompanied the screenplay for the movie, The Avengers. Former Lincoln resident and actress turned mystery writer Harley Jane Kozak writes off-beat mysteries with a quirky comic bite and a romantic twist. Her work is popular with readers, especially with women, and has gotten great reviews from the national critics. 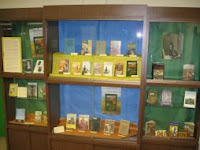 Our crime and mystery display also includes novels by Lisa McClendon, Jean Potts, and Don Winslow. Here is a link to our printer friendly crime and mystery fiction booklist. 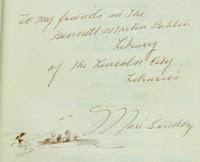 The 2009 Mari Sandoz Heritage Society Conference will be held March 26-28, 2009 at Chadron State College. The conference will focus on Mari Sandoz and her literary contemporaries, with special attention to Nebraska writer Wright Morris, who will also be the subject of a special exhibit at the Mari Sandoz Center. The influence of John Neihardt, anthropologist Franz Boaz, and Amos Bad Heart Bull will also be featured. The conference program is available. A reading list, campus map, and links to lodging are available here, courtesy of the Mari Sandoz High Plains Heritage Center. The theme of the 2009 International Cather Seminar will be "Cather, Chicago and Modernism." The conference will be held June 25-28 2009 in Chicago. Conference sponsors are the University of Nebraska-Lincoln and the Willa Cather Foundation. The Conference Program is now available via UNL's Cather Archive. Online registration is available here, via UNL's conference link. Born and raised in Illinois, Stephanie Grace Whitson has lived in Nebraska since 1975. Much of her historical fiction has a Nebraska setting. A writer who loves story-telling and character, she has a strong following of devoted fans among readers of Christian historical romance. Her novels include a number of Christy award finalists, and ECPA best sellers. Though fictional, her characters reflect careful research into their historical settings. Many of her books focus on pioneer women and on life on the frontier. Well known titles include Walks the Fire (Prairie Winds Series), one of her first books, the more recent Unbridled Dreams, and her personal favorite, Karyn's Memory Box. Check out her own Website at www.stephaniegracewhitson.com. Stephanie is a lively presenter who gave us a wonderful talk on writing in our 2007 Lunch at the Library brownbag series. The reading will take place Sunday, February 15th at 2:00 PM in the Heritage Room. Channel 5 will record the Reading for later public broadcast. Chadron State College English Professor and professional arborist Robert McEwen will be our 180th Ames Reader on Sunday, January 18th, 2009 at 2:00 PM. The reading will take place in the Heritage Room on the third floor of Bennett Martin Public Library at 136 S. 14th Street in Lincoln. Robert McEwen was born in Chicago, Illinois, but has lived in Nebraska since 1978. He earned a Ph.D. in English from the University of Nebraska-Lincoln in 1984. His 1995 Slow Tempo Press book, Heartwood and Other Poems, was published to rave reviews. Ted Kooser, reviewing "Heartwood," wrote that that poem "is remarkable not only for its ability to catch us up and keep us flying with him," but also "for the immense distance McEwen establishes between this compelling, vital, third-person narrative and the narcissistic I-whining of his contemporaries." "This is, I feel, a very important work of art," Kooser concluded. McEwen will read from his upcoming book (in press) From Corcaigh to Broken Bow. He has read for us before and we expect him to do a memorable job of bringing his poems to life.